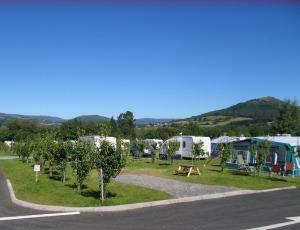 Blossom Touring Park01873 850444work Touring & Camping ParkBlossom Holiday Park is an exciting new development set in a south facing pear and plum orchard located 1.5 miles on the out skirts of Abergavenny. With an abundance of activities for all the family Abergavenny is a fantastic choice for your well earned holiday. Blossom Holiday Park has a dedicated camping area plus sixty super sized pitches measuring a boastful 40ft by 35ft, each pitch also benefits from a pear tree screening around the outer edges. Electricity is supplied to every pitch via a token meter so you only pay for what you use; water stand pipes are always close by, new shower and toilet block plus laundry facilities. Blossom Holiday Park is an exciting new development set in a south facing pear and plum orchard located 1.5 miles on the out skirts of Abergavenny.